Building with the Intermodal Steel Building Unit: It's cheaper for overseas shippers to dump the containers in the United States rather than return them to their place of origin. Tampa Armature Works with St. Petersburg Neighborhood Housing Services Inc. have started recycling them into affordable, hurricane-resistant housing in St. Petersburg, Florida. Bob Vila was there to document it (flash video). Previously on MetaFilter, a brief history of the steel boxes. This is a great idea, I think things like this show that there is some small sliver of hope for the human race. From one of the articles: "Price promises the homes won't look like containers when they're completed. They'll have stucco exteriors and drywall on the inside." I read that and thought: why bother with that? They look so cool as is! Then I went to the article Flashman linked to above and saw how the London project wasn't trying to hide what these things are, and I thought, OK, those Brits are just a little more savvy about design than those Floridians. Which I reckon comes as no surprise. flapjax, in the right urban context, I agree a "naked" shipping container could look cool. (I'm thinking of Frank Gehry's Venice Beach house.) But in most neighborhoods you would want your home to be compatible with existing architecture in most ways. I don't think there's anything dishonest with using containers as a building material that gets covered up (you would want to insulate it anyway, and there are other issues such as protecting it from rust and sunlight heating of the metallic surface). I'm just disappointed these projects aren't being done in New Orleans, where they're really needed. This is really strange. Just last weekend I became obsessed with the idea of getting a shipping container and using it as a shed. As I read this, I still have a browswer window open with links to all sorts of different places that sell them. Then I come to the blue and see a bunch of the same links. It's like deja-vu all over again. Weirdness. Considering that they appear to be doing infill development in Florida, I can understand that they'd want to construct the houses in keeping with the aesthetics of the existing neighborhood, such as they are. What I found surprising is that in the house shown on the Vila show, they're placing the containers 15 feet apart or so and using traditional building methods to fill in the gap, along with a truss roof. I wonder why they didn't just drop a third container in. I really like the idea (tons of my own little projects depend on recycling in one way or another, just because that's the stuf you have on hand) and in moderation I think the odd metal box could look really cool - as say, a shiny addition to a house, or as a shed or a garden studio. But I'm skeptical of their usefulness and economy as single family housing. To get to that same stage of construction using conventional N. American materials - say, two by sixes and plywood - takes just a couple of days, the materials are cheap and easily available, you have a huge pool of labour to draw on to do the job, and you have infinite flexibility in plan. Using these boxes, sure you start with a nice, rigid, weathertight box, but then you have to deal with all the problems and limitations of the steel box, its size and dimensions, the lack of openings, its thermal properties - largely depending skilled trades like welders and other metalworkers - and *then* you have to finish it, which is where the vast majority of time and expense in construction comes in. I think it does work well in things like that London project where you're exploiting their virtues of rigidity and stackability. To paraphrase Louis Kahn, you have to ask the brick what it wants to be, and that's how you should use it. Being inside one during a hailstorm might be interesting. It still to this day amaze me reinforced concrete and bricks aren't the standard in house construction everywhere ; not necessarily mandatory, but hell these are goddamn rusty boxes going to rust one way or another and wood isn't exactly , in my limited experience, the most time and weather resistant material. I still am a fan of Prutt-Igoe apartment complex idea , except of course for their shortcomings in density, surface per inhabitant, amenities and recreational space, underground garages etc. Well I guess I am therefore fan of something else :) Still guess the future can't be urban sprawl, but can't be Hong Kong breath strangling density either. First came This Old House and now comes This Old Shipping Container--to be followed by, no doubt, This Old Home Entertaiment Center Carton, This Old Bus Stop Shelter and This Old Shopping Cart. I'd love to have one or two of these turned into a penthouse on top of a building here. elpapacito - reinforced concrete and bricks are terrible building materials in an earthquake zone. When I first visited California I looked in horror at the wood-framed stucco houses. They appeared to be cheap, shoddy pre-fabs to my eyes. I was just too used to brick/stone built houses. Now I've lived here a while, it all just looks normal. 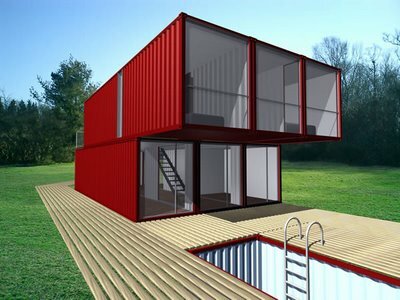 Shipping containers are quick and easy to build out. Wood-framing goes up exceptionally fast too. Even if you're not in an earthquake zone, brick and concrete are sloooow, and sloooow = $$$. wood isn't exactly , in my limited experience, the most time and weather resistant material. You've not seen the medieval-dated timber-frame houses and gigantic barns in Britain? A few thousand years isn't a bad lifespan. That's only one thousand years, FFF. I agree that brick isn't a hugely time- and weather-resistant material. Okay, the brick is, but the mortar isn't: if you want your brick house to stay up, it needs maintenance. And if you're doing maintenance, then a wood building will last just as long. For half my life I'd've been happy to live in a shipping container pretty much as is: cut holes for a door and windows, add some insulation and drywall to the interior, put in some plumbing and electricity, and you'd have a suitable Curmudgeon Camp. It you want me to feel really secure you'd cover it with dirt and turf like a tiny ridge. 20x9 feet sounds good to me; most SRO rooms and efficiency apartments are only 1/3 to 1/2 that. Think about how easy moving would be. If you can somehow keep them connected in a modular fashion, moving would be as simple as bringing in a truck with a crane and drop the containers onto a truck that would ordinarily transport the containers over land. You could even move them via interstate rail. If you really want a low-maintenance dwelling, build it underground. See also FabPrefab's "Container Bay"